Play is the Best Way! Play may be as old as human existence itself. The philosopher Plato once said, “You can discover more about a person in an hour of play than in a year of conversation.” Our brains are hardwired for playing. In fact, for young children there is no distinction between playing and learning. To a child, it’s all the same! The research related to playing and learning in the 21st century has concluded that play is necessary, essential and fundamental to a child’s development socially, emotionally, physically and intellectually. Sociologists and child development experts have distinguished 10 types of play that a child will take part in depending on their age and social setting. At School for Amazing Kids, we use all of these types of play in our classrooms and on our playgrounds. Unoccupied Play – This type of play may not look like play to a grown-up. Your child may be engaged in what looks like random movements with no objective whatsoever—like when my youngest son used to sit on the floor, pat his belly and say “dah-dah-dah” when he was 8 months old. That’s definitely play whether we grown-ups understand it or not. Independent Play – This is when your child plays alone. Don’t be sad for them! Independent play is very important. It teaches a child how to keep himself entertained, paving the way for self-sufficiency. Onlooker Play – When your child observes other children playing but doesn’t partake in the action, she is still learning and still playing! This is common in younger children and it’s a great way for kids to work on their vocabulary. They are great listeners! Parallel Play – Maybe the most adorable type of play there is! Two kids playing side-by-side, having a ball in their own little worlds. In this type of play, it may seem as if the children aren’t paying attention to one another but they are actually learning how to take turns and other social behaviors. Parallel Play is a bridge to other types of play. Associative Play – In Associative Play children begin to interact with one another—talk to one another and help one another. They are learning socialization skills, problem solving, cooperation, language development and how to make friends. Cooperative Play – You’ll see this type of play in preschoolers. This is where children truly start playing together and using all of those social skills they’ve been honing over the years. Cooperative Play looks like a group of kids playing Candyland or kicking a soccer ball around the playground together. Dramatic/Fantasy Play – If your daughter loves to wear her princess outfit everywhere or loves to host tea parties, she is playing! Dramatic play uses a child’s imagination and uses those social skills and language skills they’ve been working on. Physical Play – Fine and gross motor skills are being honed when your child is kicking the soccer ball, practicing her ballerina twirls or riding her tricycle. Physical Play is vital to setting your child up to enjoy physical activity and embracing a healthy lifestyle as an adult. 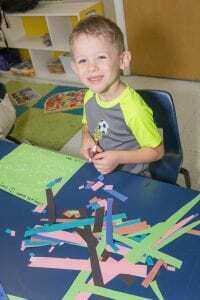 Constructive Play – Exactly what is sounds like, Constructive Play is any type of activity that involves building or creating something—building a house with Legos, setting up a train set, painting a picture, making a reindeer out of a paper plate and cut-outs of their little hands. Cognitive skills are used to help a child problem solve and figure out how make something work. Competitive Play – Your child might be winning at Hide-And-Seek or hitting homers in T-ball but either way, she’s engaging in Competitive Play. Being part of a team, taking turns and celebrating other kids’ accomplishment are valuable lessons. We really mean it when we say, “The love of learning start here.” Our schools embrace play because it is hands down the best learning tool there is. When children play, they are in a state of absolute grace and wonder, fostering creativity, sparking their imaginations and setting themselves up to love learning throughout their entire lives. We absolutely love it at School for Amazing Kids, Helena. They show genuine concern for my kids. Both of my kids are excited to go to school each day and I can see that they are learning and having fun too. After we moved to Helena, my then 4 and 2 yr old transitioned very easily. Another parent of a special needs child recommended School for Amazing Kids, Helena and it has been a great decision for us.